Fuel save up to 30%. The generators take their electrical feed from the 24V alternator supply. The generators begin the production of hydrogen only when engine is running. Production of hydrogen stops as soon as the engine is switched off. The generators are CE certified with a Class A rating for EMC and therefore will not produce electro-magnetic emissions that may interfere with the engine management system. In the event of the generators entering safe mode, production of hydrogen will stop and the generators will be shut down. The engine and all other systems will continue working as normal. CO2 is reduced by up to 50% throughout the normal duty cycle of the vehicle, marine vessel or application with ICE. 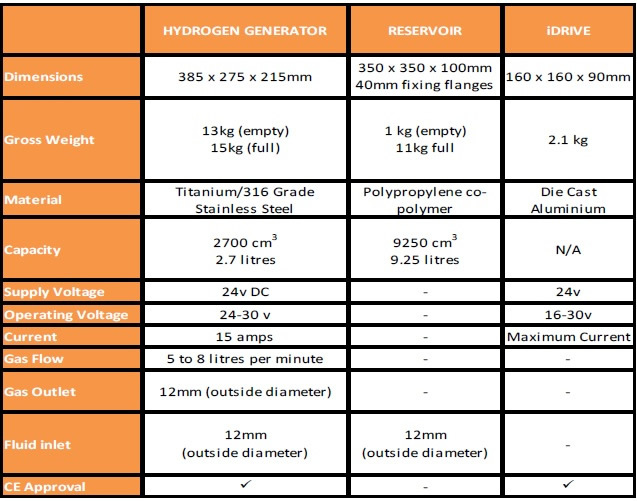 The generators produce 7-8 litres of hydrogen and oxygen per minute. The gas is dried using a two stage drying process to prevent moisture entering the engine. The dried hydrogen gas is not pressurised and enters the engine manifold through an open vented system in variable stochiometric volume, throttle pulse signal control. The flame velocity of hydrogen is much faster than other fuels allowing oxidation with less heat transfer to the surroundings. Hydrogen has a very small gap quenching distance allowing fuel to burn more complete hence promoting complete combustion. In regions of the flame near the surfaces of the combustion chamber the heat loss through the chamber wall is greater than the heat needed to sustain a flame. This condition causes areas of quenched flame where hydrocarbons are left unburned. The combustion chamber often has gaps and crevices that do not allow a flame to propagate. These areas also allow for build up of unburned hydrocarbons. The hydrogen is nor pressurised. The generators have a pressure release valve to prevent the build up of gas inside a generator in the event of misuse or accident. The generators have a two stage cooling process to prevent overheating. The generators are equipped with temperature switches to shut the generators down in case the temperature rises above a preset level or in event of an accident. Equipped with capacitive sensor to prevent running dry. CE Certified TUV Safety approved. Engines return instantly ( under 1 second ) to pre installation operation in the event of any system shut down or failure.